← Iceland to Amsterdam – Makes Perfect Sense! 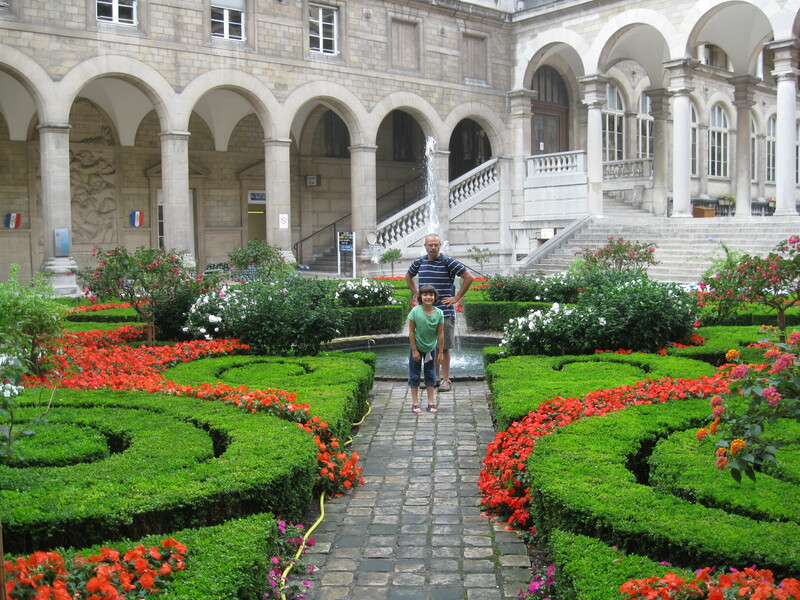 Our 2009 Paris hotel, Hospitel Hotel Dieu (a working hospital with small hotel on 6th floor), had this amazing formal garden courtyard, AND it was located next to Notre Dame Cathedral! Loved it! Amelia & Angelo pictured. I recently received two more lovely home exchange offers. I’ve had to turn both down, because, as you may already know, I’ve already arranged two fantastic home exchanges for my family for next summer. We will go to Amsterdam for a home exchange of two plus weeks, followed by a second home exchange in Brittany, France for an additional two plus weeks! Those exchanges coupled with three days in a hotel in Iceland at the beginning of the trip and two (or three days) in a hotel in Paris at the end of it, should make for an extraordinary cultural adventure for my family next summer! We may even add one more country to the mix, IF we decide to take a train ride from Amsterdam to Brussels, Belgium. My 12 year old daughter has been talking (for a few years now) about visiting Belgium for their French Fries and Waffles. She says both were invented in Belgium. Who can deny such strong reasoning for the two hour train ride, each way! Sorry for the tangent, but what I wanted to do was show you my last two home exchange offers. The first was easier to turn down, but only because it is located within minutes of the home exchange that I have already arranged in the Amsterdam area. Here’s the Amsterdam exchange I’ve had to turn down. The second exchange is much harder to turn down. The family is offering their primary home, located only five miles from the center of Paris AND their vacation home located mid-way between Paris and Normandy. So why in the world am I turning this incredible offer down??? I can tell you, it is not easy to do; but it’s because we can’t add another two weeks to our already month plus long trip. Not that we haven’t done it before. In 2oo9 and 2011 we were lured by incredible home exchange offers to spend a full six weeks in Europe – not a hardship, I assure you. Unfortunately, now that my kids are older, they prefer to return home sooner to have some summer left to be with their friends. For that reason, I am forced to turn down this amazing offer of two homes near Paris and Normandy! The things we do for our children! So instead of a free two week home exchange in a great family home in Paris, we will have to spend a minimum of $250 – $300 a night (I know, I’ve done extensive research) for my family to stay in a little hotel room in Paris for two – three days at the end of our trip; and I can’t lie – that hurts! As I’ve said before and I’ll say again; the only negative thing I’ve experienced about home exchange is having to turn down so many incredible offers of exchange! This entry was posted in Uncategorized and tagged amsterdam, belgium, brittany, brussels, France, home exchange, hospitel hotel dieu, notre dame cathedral, Paris. Bookmark the permalink.